At this time in Trinidad and Tobago the festival of Ramlila (called Ramleela there) is very widely celebrated. This is an ancient Hindu tradition brought to the Caribbean from India by indentured servants, but its practice and customs are now firmly entrenched in a brand of Caribbean performance where it has survived. The Ramleela gains strength every year in Trinidad as one of a number of traditions in the weeks leading up to Diwali. But it is a strong festival on its own. Of great interest is that this was once vibrant in Guyana. It ceased decades ago and faded away altogether, but research is incomplete and there is no reliable information to explain the reasons for this. Religious and performing groups have taken an interest. The Guyana Hindu Dharmic Sabha’s dance and performing company directed by Vindhya Persaud revived it in an excellent production on stage some years ago and there is a Guyana Ramlila association that performs excerpts on stage occasionally. But these have not influenced any return of the tradition in its original form among villagers. 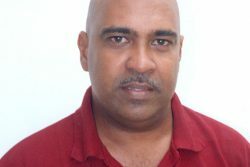 What is remarkable is that while it becomes more forgotten in Guyana and struggles to sustain interest even among Hindus, it is gaining popularity in Trinidad, where it plays to a wide audience. Research in these areas is rather under-developed and the factors responsible for the stark difference between these countries are curious but yet undetermined. Without a doubt, Hinduism fuels it in Trinidad where, as Derek Walcott remarked in his Nobel Lecture (1992), for the villagers who practice it, it is far more than theatre – it is faith. But there is no shortage of religious fervour in Guyana either, and in fact, this strength of belief drove Guyana to develop an element of Diwali that is unparalleled anywhere else in the Caribbean. While the grand festival of Diwali has already gathered full momentum in Trinidad, it does not have the same pre-season build-up in Guyana and has not yet taken off with three weeks to go. Trinidad has many more pre-Diwali celebrations, but Guyana has the grand, elaborate, spectacular motorcade that outshines all else. On the other hand, Ramlila has not only survived, but thrives and grows in Trinidad. Clearly it gains strength from the pre-Diwali season, but it exists in its own right, with its own form and practice. However, according to Hindu mythology, it is not totally unrelated to the story of Diwali. Ramlila is a religious festival that celebrates the principles of Hinduism. Unlike other festivals of religion, however, it has no sacred rites of prayer, worship, purgation or rituals. It is performance, but it is social engagement, religious instruction – it is theatre, a dramatic play; it is masquerade. It is a play, but a very large one of festival proportions, produced and performed entirely by people in villages and not by professional dramatists. It has the extraordinary distinction of being the longest play known to mankind – it is some 40 hours long and takes 9 or 10 days to perform. The audience returns every night and the cast of villagers carry it on, performing roughly 4 hours each night for 9 or 10 days. It is performed outdoors on virtually the largest stage known in theatre, in an open field – most likely the football field or cricket ground in the middle of the village. The audience stand behind barriers on all four sides of the stage. It takes the form of a lengthy dramatic narrative – as the narrator reads each part as it is acted out in mime and in dance by the performers, who will often have to actually fire arrows or engage in sword fights. These acts are accompanied by tassa drums that provide music throughout the play. Costuming is detailed, meticulous and spectacular. It is realistic costuming with a cast of princes, warriors, gods, demons, servants and women. Stage props are also elaborate, and will include bows and arrows, swords, sticks, inter alia, everything made by the people over a long period before the event. This community spirit and engagement is important. Spectacle is premium since the stage is vast, the style epic and there is a lot to look at. The name Ramlila does not have one standard spelling or representation. It appears variously as Ramlila, Ramlila or Ramleela. While Ramleela is more commonly used in Trinidad, Ramlila seems favoured in Guyana. The plot of the play is the story of Lord Ram (Rama), very sacred to Hinduism; “lila” is story or play, and the word means “Ram’s play”. Further, in Trinidad it is often called Ramdilla in the creole language of the villagers. This performance of Ram’s Play originated in India around the sixteenth century. Centuries before, Valmiki had written the holy text The Ramayana in Sanskrit, the holy and scholarly language. Centuries later there came the scholar, writer and holy man Goswami Tulsidas who was intensely devoted to Hinduism. It is said he was a reincarnation of Valmiki. He was very concerned that the majority of Indians could not read The Ramayana and were therefore deprived of the religious instruction contained in the stories. He translated the book into a local language that was more accessible to the people, producing a version known as Ramcharitamanasa. But Tulsidas did more. As a playwright, he created the Ramlila so that the story of Ram could be dramatised, played out in front of peasants and villagers including the multitudes who could not read the book. In that way they could be educated by seeing the play, which therefore became not just drama, but religious instruction. The Ramlila was performed in open fields in India and then brought to the Caribbean during indentureship. Performances in the Caribbean continued the intent and purpose of Tulsidas, but looking at the performances today it is obvious that the style is very much Caribbean. The stage is much suited to this as it is theatre in the round. This is a Caribbean quality because so many traditional theatrical rituals and performances are done in the round – in spaces surrounded by other participants or spectators. The elements of mime and dance continue this because of the prevalence of these forms which often accompany the story-telling tradition. The same may be said for music as the tassa drums are ubiquitous in folk performances. The tradition will also include the use of the narrator/story-teller/raconteur. Felicity is perhaps the most famous site for Ramlila in all of Trinidad. During performances there, all of the elements stated above are noted. The narration of the drama is done by a pandit or someone who is familiar with the text and knowledgeable about the religion. This allows him to contribute to the education of the audience. It is to be pointed out that this is very much a Hindu festival whose participants are Hindus. It is further assumed that the audience is Hindu, since the intention is to instruct them about their religion and make them better Hindus. This is the context in which the narrator addresses the crowd. He reads from the written text, but very often departs from it to improvise, to comment, to analyse and to preach. Lord Ram, the god-king is regarded as the great exemplar – on earth to be an example to all as the perfect king, the perfect husband, the perfect man. Similarly, his wife Seeta (Sita) is the model of chastity, loyalty, womanhood – the perfect wife. Even Ram’s brother, Prince Laxshman, sometimes demonstrated admirable qualities. These are frequently commented upon by the narrator for the benefit of the audience. To go further, examples are drawn from the village life, conduct, occurrences and incidents known to the audience in order to show them how they should behave. Another factor is the element of spectacle and how it is integrated into the plot, the message and the catharsis. 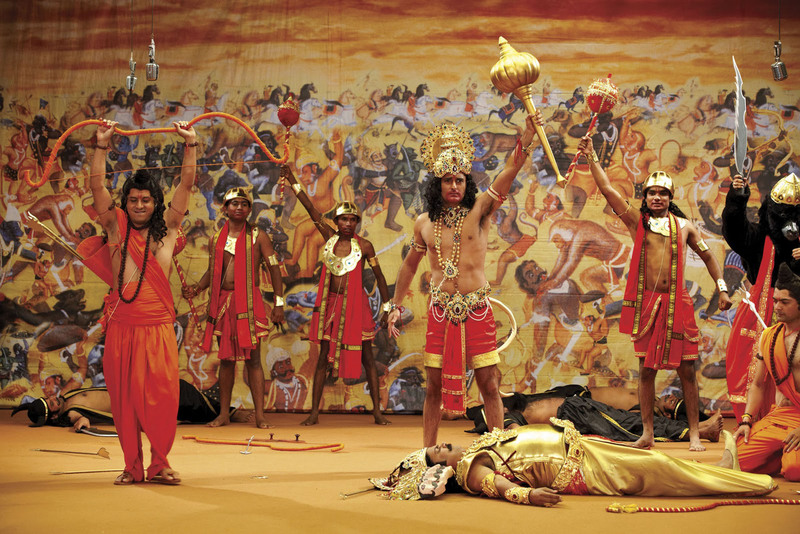 Throughout the play, there is a giant image of Rawan, the demon king of Lanka and enemy of Ram, which stands more than 40 feet tall at one corner of the ground. Ram defeats Rawan in battle at the end of the play, after which the warriors shoot their arrows into the effigy; the arrows are edged with fire. In the myth, Ram and Hanoman sack Lanka by burning it in the final victory. So the flaming arrows at the end of the drama burn the effigy to the ground. That great image makes quite a spectacular conflagration which is also an emotional lift for the audience who cheer on the final destruction of the villain. 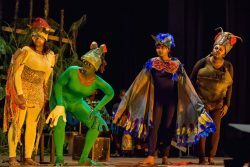 The element of masquerade in Caribbean performance is equally present, particularly in one performance of Ramlila seen in Chaguanas, Central Trinidad. Following the fall of Rawan, Ram marches off in triumph. In that performance Ram’s triumphant march turns into a parade through the village streets in full carnivalesque fashion. To this, also add the factor of audience integration. Members of the cast take the procession out through the gate and into the streets, joined by members of the audience. That street procession is additionally symbolic. Ram, Seeta and Laxshman return home to Ayodhya after the victory over Lanka, so the street march may represent that too. At this point, the drama has its most direct link to Diwali. The great festival of lights expresses devotion to the goddess Lakshmi, but one part of the myth refers to Ram. The night on which he returns home to his kingdom after the end of his exile was the darkest night of the year. The people lit rows of diyas both to welcome him and to help show him the way home. Throughout the past week this play would have been performed in many locations around Trinidad. These include new additions. The performances were advertised and promoted, lending life to the ongoing atmosphere. Announced were the ‘Bal Ramdilla,’ the ‘Dow Village Ramleela’ and events in Princes Town. Apart from Felicity, other villages around the Chaguanas area, in South Central and in South Trinidad are well known for producing the festival. But today the celebrations have multiplied around the country with locations as far north as Tunapuna and Arouca.